Confused why I’m eating salmon? Many people write to me asking why. 1. Fish isn’t inherently high histamine – spoilage causes the histamine to rise. I live close to the beach so I know this stuff is fresh, and I go to buy it the day it comes in. 2. It’s not true that dark fleshed fish is higher in histamine. Check out my interview with Dr Janice Joneja where we discuss this and much more. they’re also up to a whopping 10 times higher in inflammation fighting omega 3 fatty acids! 200mg – 600mg (depending on variety) omega 3 fatty acids in white fish. If you make this recipe with anti-inflammatory superstar holy basil, then we’re talking off the charts anti-inflammatory action. As I’ve said a number of times, I find that lowering my overall inflammation, rather than stressing whether a food is on a high histamine list somewhere (and come on, how do you really think salmon stacks up against that cupcake you just couldn’t resist? ), has helped me get to where I am, in just under a year. I don’t follow other people’s lists, just my own personal experience and intuition. You’ll find more low histamine, anti-inflammatory recipes in the Anti-Cookbook: High Nutrient Antihistamine & Anti-inflammatory Recipes for Health. Prepare the pasta according to directions. I’m not really eating grains nowadays but am still indulging in a little rice here and there. GF pasta has come a long way in the last few years, just be careful not to overcook if using rice based, and be sure to rinse under cold water once done. Meanwhile, get started on the salmon. Heat up a little oil in a medium pan, and cook till no longer pink. You could always grill in the oven if you’d prefer less oil. Once it firms up a bit, use a spoon to chop it up a bit to cook faster. Grab your blender’s spice mill attachment if you have one, otherwise use your food processor. Add in the washed basil leaves, olive oil, garlic and nuts. I was told pine nuts are alright histamine-wise, but I would advise trying a couple first, unless you have had anaphylactic episodes – in which case, be safe and go nut free! Pulse the mixture until it’s still a little coarse. Once cooked, add the salmon to the drained pasta and put on the lowest heat. 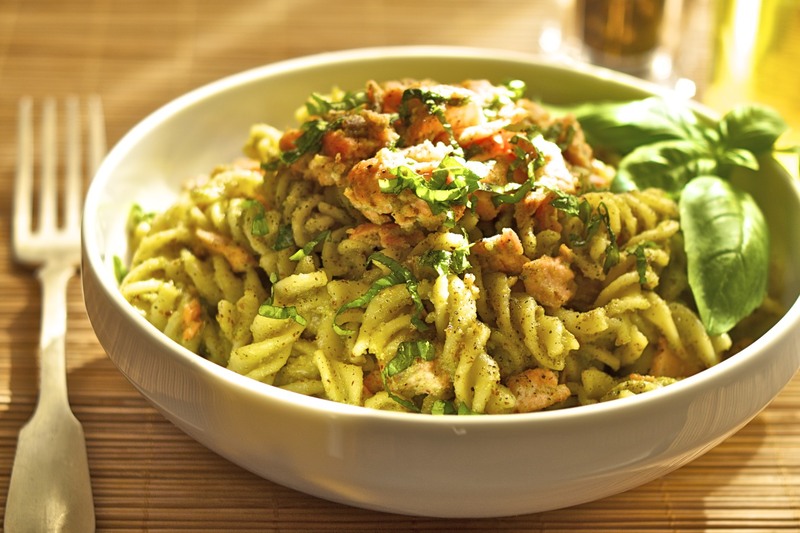 Pour in the pesto and mix with the pasta and salmon over the heat. I know it’s not traditional but I love adding some lemon to dish. If you don’t tolerate lemon, or worry about it’s minimal histamine liberation, you could use lemon basil in the pesto instead. Because I’m most interested in food’s healing properties, I’ll often use holy basil instead of sweet/European varieties. Read all about holy basil here.